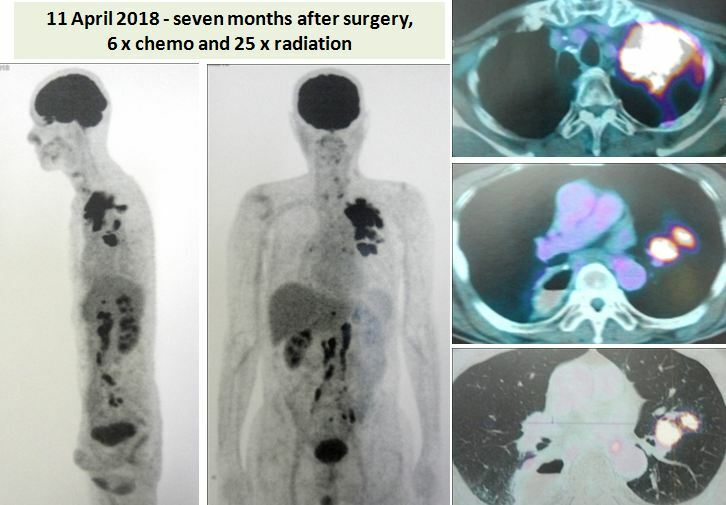 Cancer of the Oesophagus: Surgery, chemo and radiation failed. RM 200K gone! PK is a 61-year-old Malaysian. In April 2017 he had difficulty swallowing. He consulted a doctor in Ipoh. Long segmental circumferential wall thickening of the mid-oesophagus with luminal narrowing. No evidence of local infiltrations or mediastinal lymphadeopathy. PK was referred to a private hospital in Kuala Lumpur for further management. FDG avid primary at the mid oesophagus. Intense FDG uptake in the left upper lobe lung nodule — suspicious of metastasis. Small focal FDG avid lesion at L3 vertebra — suspicious of small volume metastasis. No conclusive FDG avid lesion demonstrated elsewhere. PK was told to proceed with one cycle of chemotherapy immediately. Five days later he had surgery. 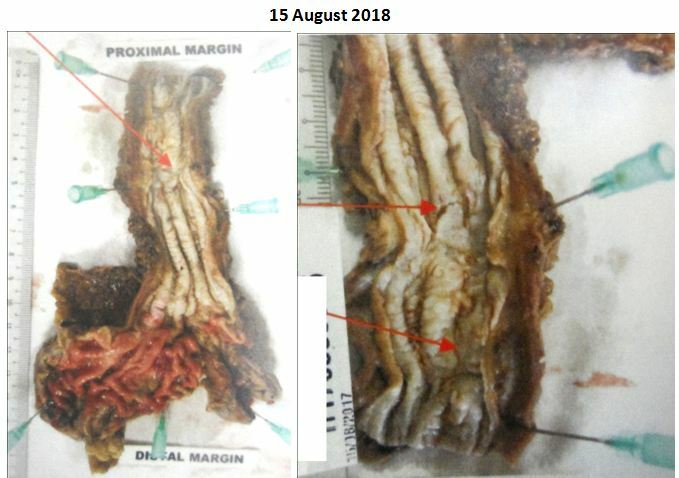 The total length of the tissue removed is 20.05 cm (picture below). This is made up of 10.04 cm oesophagus and 5.0 cm stomach tissue. Histopathology report confirmed a moderately differentiated squamous cell carcinoma, ypT2ypN2. Four of the 26 lymph nodes examined were positive for tumour metastases. Following the standard procedure, PK underwent six cycles of chemotherapy and 25 sessions of radiotherapy. A repeat PET scan was done seven months later. Is the cancer gone or is he getting worse? 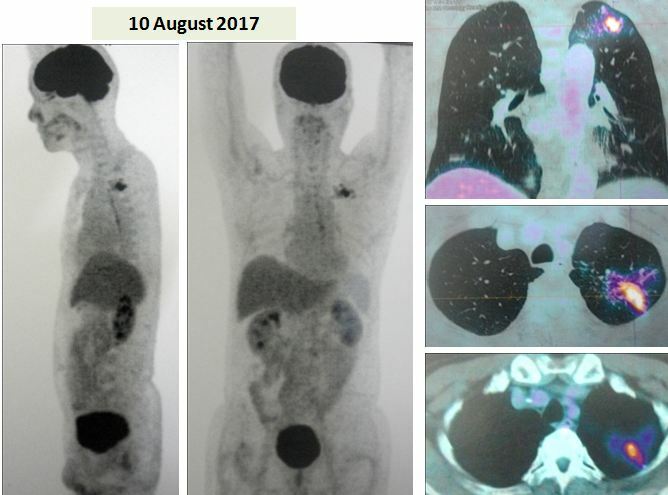 Study the three pictures below and compare them with the PET scan done on 10 August 2017 (above). You don’t need to be a doctor to know that PK is not getter better. He is getting worse and the cancer has spread more widely. New development of large reticulonodular changes at the left upper lobe, probably related to post-radiation inflammation. New FDG avid mediastinal nodes, probably reactive nodes from inflammation. Metabolic increment in the left level IV cervical node. Mixed metabolic changes in the retroperitoneal and pelvic nodes. New development seen at thoracic stomach wall nodule and peri-bowel node at celiac axis, and celiac trunk nodes. All told, PK had spent about RM200,000 for this failed medical treatment. He was asked to undergo more chemotherapy. PK refused and came to seek our help. Below is excerpts of our conversation that morning. Generally most patients who come to us are those who have undergone all medical treatments and failed, like PK’s case. They probably have nowhere else to go. Then suddenly through words of a friend or the internet, they discovered CA Care. That is okay — after all this is what CA Care is about — to help those who are lost and in need of help. Unfortunately, some patients are rather unrealistic. Even at this point of failure, they come with the hope that we can offer them a cure! That is impossible. We do NOT promise any cure. We only promise to do our best to help. There is also another disappointing group of patients. They come seeking our help on their own terms and some even at their own time. They want to do things their way. They only want capsules and don’t want to drink the bitter teas — too much work having to brew them! What if I go for a holiday? They want to eat anything they like. For such patients, I generally send them home without any herbs. It is better for such patients to find someone else to help them. Our core belief is that YOUR health is YOUR RESPONSIBILITY. We teach you how to get well but it is you who need to take charge of your own healing. One of the things I often look for when talking to patients is their attitude and commitment. Do they believe in what we are doing — taking herbs and changing of diet, etc.? If you do not trust us or believe in what we do there is no reason why you should come to CA Care in the first place. When PK was first diagnosed with oesophagus cancer he put his total trust in the doctors. He underwent surgery, chemotherapy and radiotherapy and along the way spent RM200,000. Did he ever thought or believe in an alternative healing method? No. Did he know about alternative healing? I believe it is a big YES. PK came to CA Care with his sister who is our patient. His sister had breast cancer. She underwent an operation to remove her breast and was treated with chemotherapy. After one shot of chemo, she suffered badly — difficulty breathing and the colour of her skin turned dark. She gave up chemo and started to take our herbs. That was in June 2005. Now, it is October 2018 — thirteen years — and she is doing well and has no problems all these years despite forgoing her schedule to do six cycles of chemo. From my conversation with PK and his family, I sensed that he has zero knowledge about cancer. To him doctors know best. And he is wealthy enough to be able to pay the medical bills. Whatever it is, after seven months of medical treatments, we know the reality of what modern medicine has done for him. There is no need to find a scapegoat. What is done is done. For those who wish to learn, take note of what had happened to PK. Since the past two decades I got to learn new things everyday! So I am sharing with you both the good and bad news so that we can all learn from these experiences. I prescribed PK some herbs and told him to take care of his diet. I hope to see him again in the next two or four weeks, that is if he ever comes back again for more herbs! (Update: Yes, he did come back after two/four weeks, but I told him: If you find the herbs difficult to take or if they don’t help you, please stop taking them. Find other person to help you). About this same time, I also have another case of oesophagus cancer. Let’s call him Alex, a 58-year-old man from Melaka. Like PK, Alex too had problems swallowing food. Alex was subsequently diagnosed with cancer of the oesophagus. Unfortunately the cancer had spread to the stomach and bones. Alex refused surgery or chemotherapy and came to seek our help instead. How did Alex know us? Through a friend in Melaka who had stomach cancer. 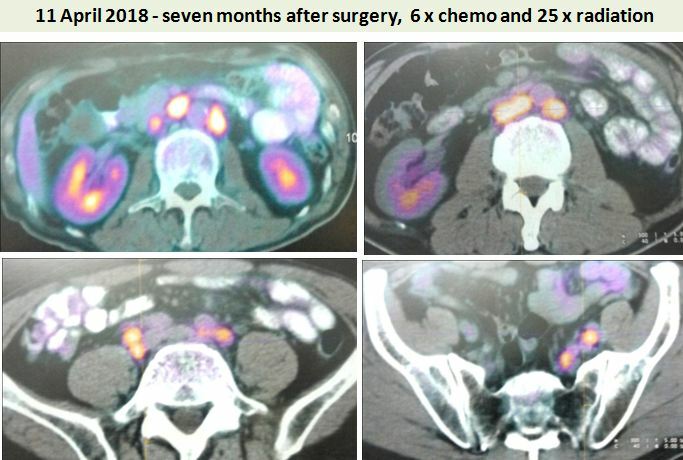 This friend underwent surgery but refused chemo. Through the recommendation of the surgeon who removed his stomach, this patient came to seek our help. It has been three years now, and this friend is doing well. Perhaps because of this friend’s experience that Alex came to us with high hope that we could help him. surgery is probably a good option to solve his swallowing problem. He was adamant — he would not go for any surgery. I have to respect his decision. I also know that surgery would not cure him because the cancer had already spread to the stomach, many lymph nodes and bones. I struck a compromise with Alex. Okay, take the herbs for about a month and see what happens. If there is no improvement, he should go for the operation. If the herbs do not help and he still refuses surgery then he should go and find someone else who can help him. I cannot help him anymore. Alex came back after two months! He has no more problem with his swallowing. He seems to be able to carry on with his life like any normal person, except of the pains in the backbone because of the cancer. Is he cured? Definitely not. So what is next? I really don’t know. But for now we can see that his outcome is better than PK. There is no drama and no suffering. On top of it, there no need to spend RM200K in seven months!